After leaving the Rain Forest, I returned to my friend's house in Sea Tac, WA, and drove to Vancouver, Canada. At first I went to the Vancouver Downtown Hostel on Burnaby Street. The Hostel USA book gave an excellent review for this new hostel. Unfortunately, there were only 6 parking spaces. Which makes sense because most hostellers are backpacker's and take public transportation. So I went to the Jericho Beach Hostel. This is also a very large, crowded hostel , but the bunk rooms were arranged in such a way as to give the illusion of semi-privacy. So it wasn't bad. There was ample, safe parking. 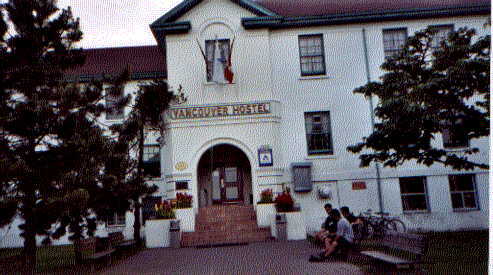 It was located right on the ocean, and a shuttle bus provided transportation to downtown Vancouver. What more could you ask for? In the morning, after I left the hostel, I went to Denny's for breakfast in Vancouver. I sat there for quite awhile trying to figure out whether or not I could afford to drive to Alaska. I don't know where the idea came from--it wasn't in my plans at all. I knew I didn't have enough cash. I wondered if I could use a credit card. If I was extra frugal (more peanut butter sandwiches and tuna out of the can), maybe it wouldn't cost too much. I figured I'm so close to Alaska. I'll never be this close again. Should I try it? Could I do it? I had no idea how far it was. Decided to go back to the US and stay for a night or two at the Birch Bay Hostel right over the US-Canadian border. Maybe there I could get some information and learn more about what it would take to drive north to Alaska. Had some thinking to do. Now, a year later after taking this road trip some people still ask, "How could you afford to take a trip like that?" Well, I afforded it by scrimping and cutting corners--roughing it. Every meal that I ate out of a can was money saved to pay for a hostel or campground for the night. During the later stages of the trip, I discovered that it was possible to sleep in the back seat of my Kia (I only did that about 5 times when I had no other choice). It was tight, but possible. Also, I bought the cheapest, fuel efficient car that I could find--plus it still had the 5 year bumper to bumper warantee and 5 yr. free roadside service (which I never had to use). I didn't go out and buy a SUV or motorhome (I couldn't afford them anyway--even if I could have, I wouldn't have unless they were small & fuel efficiant. There were many roads where motorhomes could not travel because they were too big and heavy, or the road was too narrow or steep. My Kia could slip in just about everywhere. Since that first trip, I've learned even more ways to--rough it and save money. Learned not to buy a bunch of useless "things" as gifts for people at home--no one really wants some T-shirt, cup, etc. from your trip. The person taking the trip is the only person who really cares to remember it. During the first trip, I bought tons of gifts. Often ended up having to pack them into boxes and mailing them home because I had too much stuff in the car. Little "cuts" here and there can make the trip more affordable--if your willing and able to rough it sometimes. If I was rich, I probably wouldn't rough it. Or maybe I would--it just wouldn't be so scary knowing that I had some "extra funds" to fall back on if I needed them. I wonder if anyone has actually read this far down in the page.